This June, I had the privilege of accompanying Dr. Fabio Colivicchi and the Queen’s Classics department (http://www.queensu.ca/classics/matera.html) on an archaeological excavation in Cerveteri, Italy. The excavation explored the Etruscan site of ancient Caere, which was a major southern Etruscan coastal city. Caere was one of the closest Etruscan cities to Rome, and was renowned for its religious significance and customs (the word “ceremony” even comes from the Latin word caeremonia, which means “pertaining to Caere”). We were working in the civic and spiritual centre of the city, excavating an exceptional Etruscan religious structure, called the Hypogeum of Clepsina. It is a subterranean ritual chamber which is constructed and oriented according to Etruscan cosmology, and which contains Hellenistic Etruscan frescoes, inscriptions, and a network of tunnels and staircases. In a nearby trench, we also excavated a late Etruscan and Roman urban area, in which we uncovered a Roman road, a possible domestic structure, and an underground shrine. 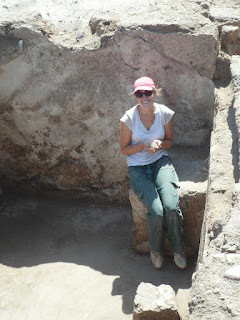 This was my first archaeological excavation, and I was thrilled to learn more about archaeological theories, techniques, and practices. On the weekends, we visited many important Etruscan sites, such as the Villa Giulia in Rome, the Banditaccia necropolis of Caere, and the painted tombs of Tarquinia. We also visited many of the important Classical sights in Rome, such as the Coliseum, the Roman Forum, and the Pantheon. One of the highlights of the trip was an excursion to Hadrian’s Villa in Tivoli, which had some of the most fascinating and beautiful Roman ruins I have visited. I had such an amazing experience on this excavation that I hope to return and continue digging next year. For the rest of the summer I am continuing to work on my USRA project, in which I relate what I learnt about the Etruscans during my trip, to further research about their culture and art. My research focuses on the vibrant funerary frescoes which adorn many Etruscan tombs, examining their thematic content and iconography to reveal evidence of Greek influence. Through this research I hope to understand better about the formative influences and cultural stimuli, both foreign and local, that created and contributed to the colourful and unique society of the Etruscan peoples.